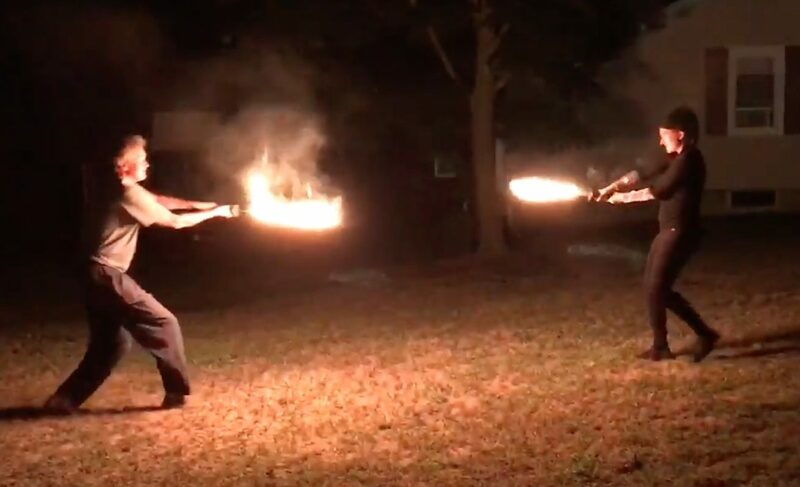 This weekend had my first experience swinging the blazing fire sword, as they say, my “virgin burn.” I hadn’t planned on it, had just mentioned to friend Jessie Jewels, who teaches “flow arts,” including the fire hoop, that I’d like to try the fire sword sometime. “Let’s do it now!” she replied. So there it was, my first time with fire sword, and it was a duel with Jessie Jewels. I enjoyed it. No doubt 20 some years of practice with traditional staff and wooden swords in Shintaido helped — it felt natural to swing the flaming sword in front of me. I didn’t particularly feel any heat, didn’t feel unsafe at any time (two friends were standing ready with fire blankets, part of the safety precautions). There was a more grand feeling as I swung the sword than I usually feel swinging the jo staff or bokutoh. And my body responded as a result, moving in a more smooth and grand way as well. (It’s a flow art, after all). Things I noticed: at first I was getting used to the feel of the fire sword, cautiously moving, careful with the space with Jessie. Jessie is much more experienced than me at fire arts, and came out swinging fast. Dramatic and fun. After a while we started to play with the space as well, moving around each other — I could feel the connection and play with it. And that’s at the heart of it — working with partner, communicating through the sword and movement, playing. Just plain playing. Acknowledgements also to Jeffrey Fong, who artfully created the fire swords at makerspace Artisan’s Asylum using the CNC plasma cutter and aircraft grade aluminum. And drum master Dave Curry — with Jessie, they are synergistically invigorating the flow arts community in MA and RI with new forms. Fun friends to play with.